You printed an amazing model with resin, but you do not know how to make it perfect? Well, obviously you will need to work a little bit more and make it smoother and free from residues. If you have ever tried 3D printing with resin, you might realized that it has a completely different working method than filament printing. It’s not only because of the material used, also the printed models require a few steps more of post-process in order to get the print ready to use. When we print with resin, we obtain a “wet” model, which has on its surface residues of resin that has not been cured. This is because of the contact of model with the resin in the VAT along its displacement on Z axis. Cleaning properly the adhered resin on the model’s surface is very important and you will realize that a smooth model makes a great difference on the final work. That’s why in this post we would like to share an effective way to clean your resin parts. Generally, this wash is done with isopropyl alcohol (IPA) but this presents some important problems / drawbacks. First of all alcohol is a highly flammable liquid and it can cause some safety issues. Breathing frequently IPA can considerably irritate the mucous membranes. It is not advisable to use alcohol with an ultrasonic cleaner (because it is an electronic component). Risk of inhalation poisoning (being near an open alcohol container, or using a spray), can cause headaches and dizziness. Isopropyl alcohol does not effectively break down all resin materials, it only dilutes them, giving the appearance of cleanliness but saturates very quickly. This makes it inefficient, leaving residual resin on the models. The alcohol emulsifies with the uncured resin on the surface of the impression causing the surface to become turbid and nullifying the natural transparency of the resin. When cleaning the models with IPA, if remains some residue of it during a prolonged time, the cracks on model surface will be evident or even very Deep fracturing the model. Inorder to avoid these technical and health issues , we recommend a safer way forcleaning process, thanks to Monocure3D; RESINAWAY®. After discovering thisproduct, we are sure that you will not need anything else to clean your resin parts! RESINAWAY® is NOT flammable! That is why it is completely safe to work with it! RESINAWAY® is designed to “attack” uncured resin. It means that it changes the chemical structure of resin to be water soluble. It converts non-washable resin into a washable one after the curation proccess. Although the price per liter is slightly higher than alcohol, this liquid saturates much less so it will LAST FOR MANY MORE WASHES. 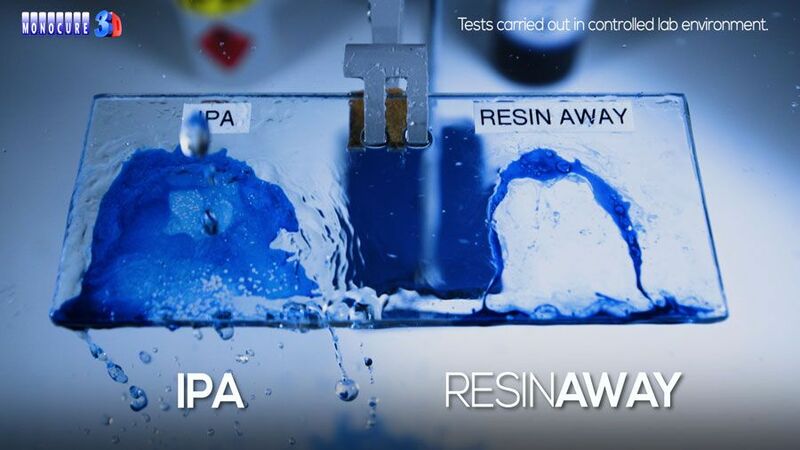 RESINAWAY® will not emulsify with uncured resin on the surface of your printed model. It will keep the original brightness and transparency of the printed part. It will NOT create any surface crack! Even if some residue remains on your model for a long time, definetely it will not damage its surface. Do not forget to share your comments and experience with RESINAWAY® product! Also feel free to leave your questions as comment below, we will behappy to help you! ← ¿Cómo limpiar las impresiones 3D de resina?